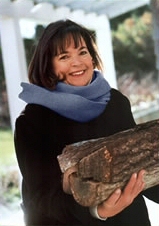 Ina Garten in the kitchen of her East Hampton home. Ina Rosenberg Garten (born February 2, 1948) is an American chef, former caterer, cookbook author, columnist, and hostess of the Food Network program Barefoot Contessa. Known for demystifying fine cuisine with an emphasis on quality ingredients and timesaving tips, she has been championed by the likes of Martha Stewart, Oprah Winfrey, and Patricia Wells as a top authority on cooking and home entertaining. Garten had no formal training, and instead taught herself culinary techniques with the aid of French and New England cookbooks. Later, she relied on intuition and feedback from customers and friends to refine her recipes. She was mentored chiefly by Eli Zabar, of Eli's Manhattan and Eli's Breads fame, and domestic maven Stewart. Among her hallmark dishes are cœur à la crème, celery root remoulade, pear clafouti, and a simplified version of bœuf bourguignon. Her culinary fame began with her gourmet food store, Barefoot Contessa; Garten parlayed this success into a string of bestselling cookbooks, magazine columns, self-branded convenience foods, and a popular Food Network television show. Born in Brooklyn, New York and raised in Stamford, Connecticut, Garten was the second of two children born to her surgeon father and homemaker mother. Strongly encouraged to excel in her school career, she showed an aptitude for science and often won top honors in local science fairs. Garten's mother, an intellectual with an interest in opera, refused her daughter's requests to assist her in the kitchen and instead directed her to concentrate on schoolwork. Garten has described her father as a lively individual with many friends, and has commented that she shares more characteristics with him than with her mother. At 15, she met future husband, Jeffrey Garten, on a trip to visit her brother at Dartmouth College. After a year of exchanging letters, they began dating when Garten turned 16. After high school, she attended Syracuse University with plans to study fashion design, but chose to change her major to economics. However, she abandoned her educational pursuits to marry shortly thereafter and did not obtain a degree. In 1968, Garten left New York and relocated with her husband to Fort Bragg, North Carolina. At this time, she began to dabble in cooking and small-scale entertaining in an effort to occupy her time while her husband served his four-year military tour during the Vietnam War. After completing his term, the couple journeyed to Paris, France for a three-month camping vacation that Garten has described as the birth of her love for French cuisine. During this trip, she experienced open-air markets, produce stands, and fresh cooking ingredients for the first time. Upon returning to the States, she began to cultivate her culinary prowess by working her way through the volumes of Julia Child's seminal cookbook, Mastering the Art of French Cooking. Her weekly dinner party tradition began taking shape during this time, and she refined and polished her home entertaining skills when she and her husband moved again in 1972, this time to Washington, D.C. In Washington, Garten worked in the White House and took business courses at George Washington University while her husband worked in the State Department and completed his graduate studies. Originally employed as a low-level government aide, she climbed the political ladder and was assigned the position of budget analyst, which entailed writing the nuclear energy budget and policy papers on nuclear centrifuge plants for then-Presidents Gerald Ford and Jimmy Carter. Strained by the pressures of her work and the serious, high-power setting of Washington, Garten once again turned to cooking and entertaining in her free time, constantly arranging dinner parties and soirees at her home on the weekends. Meanwhile, she was buying, refurbishing, and reselling ("flipping") homes in the Dupont Circle and Kalorama neighborhoods. The funds from these sales gave Garten the means to make her next purchase, the Barefoot Contessa specialty food emporium. Garten left her government job in 1978 after spotting an ad for a specialty food store in Westhampton Beach called Barefoot Contessa. She made a hasty decision to purchase the store after traveling to view it, and moved to New York to assume ownership and management. The store had been named by its original owner in tribute to the 1954 film starring Ava Gardner, and Garten kept the name when she took over, as it meshed well with her idea of an "elegant but earthy" lifestyle. After a month of training with the original owner, she took over full ownership and management of the shop. Barefoot Contessa became extremely successful in short order, bolstered by Garten's sophisticated but simple dishes, self-branded line of gourmet coffees (manufactured by Eli Zabar), and party catering services. 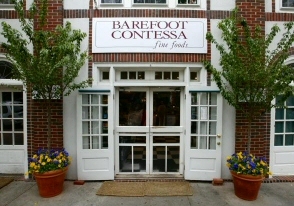 Storefront of Barefoot Contessa at 46 Newtown Lane in East Hampton, New York, now defunct. While doing much of the cooking herself, she employed local chefs and bakers as the business grew, including Anna Pump (who later established the Loaves & Fishes bakery and Bridgehampton Inn). Within a year, she had moved Barefoot Contessa across the street from its original location to a larger property. However, it soon outgrew this new location; in 1985, she relocated the store to the newly-vacated premises of gourmet shop Dean & DeLuca in Long Island's exclusive East Hampton village. East Hampton was a year-round community in contrast to Westhampton's beach season atmosphere, and provided a larger, wealthier demographic. Here, she expanded the emporium from its original 400 square feet (37 square meters) to over 3,000 (278 square meters), over seven times its original size. In this new, larger space, the store specialized in delicacies such as lobster Cobb salad, caviar, imported cheeses, and locally grown produce, and the store quickly became a gathering place for the affluent New York town. It became such a landmark for the community that director Nancy Meyers chose to use the store as one of the settings for the Jack Nicholson-Diane Keaton film Something's Gotta Give. The shop was also praised in the press by celebrity clientele such as Steven Spielberg and Lauren Bacall. In 1996, after two decades of owning and operating, Garten again found herself seeking a change and sold the store to two employees, Amy Forst and Parker Hodges. Unsure of what career step to take after selling the store, she took a six-month sabbatical from the culinary scene and built offices above the shop. There, she studied the stock market and attempted to sketch out plans for various potential business ventures. Her website, Barefoot Contessa, became high-profile at this time as she began offering her coffees and a few other assorted items for purchase online. The store was permanently closed in 2004, when the lease expired on the property and negotiations failed between Garten (the owner of the building in which Barefoot Contessa was housed) and the new owners. It has been reported that her refusal to meet lease negotiations was actually a method of reclaiming control of the store after Forst and Hodges lost business to new competitor Citarella. Ultimately, she chose not to reopen the shop, and instead retained the property for potential new tenants. Under the guidance of her husband, Garten reemerged in 1999 with her attention turned to the publishing industry. 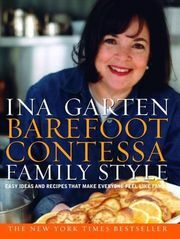 She carried on with the Barefoot Contessa name in her 1999 sleeper bestseller, The Barefoot Contessa Cookbook. Filled with the recipes that made her store successful, the book far exceeded both Garten's and publisher Clarkson Potter's expectations. After an initial pressing of 35,000 copies, a typical number for a debut cookbook, it immediately required second and third print runs and eventually sold over 100,000 copies in its first year. In 2001, she capitalized on her new-found fame and released Barefoot Contessa Parties!, which also produced excellent sales and garnered good reviews, and followed this with Barefoot Contessa Family Style in 2002. The Barefoot Contessa Cookbook and Parties! were nominated for 2000 and 2002 James Beard Awards, in the Entertaining & Special Occasion Cookbooks category. Parties! was a surprise entry, as she was considered inexperienced and untrained to compete with fellow nominees, revered French chef Jacques Pépin and international wine expert Brian St. Pierre. Her cookbooks depart from the usual encyclopedic format most culinary tomes follow, and are instead modeled after coffee table books. Filled with color photography, with a facing full-page picture for each recipe, detractors sometimes criticize this method as it leaves less room for recipes, particularly at the comparatively steep MSRP of $35 each. Nevertheless, criticism has been sparse and her cookbooks have received overall positive reviews, with fellow chef Giada De Laurentiis recently naming Garten as one of her favorite authors. As of 2004, Garten's first three cookbooks combined had sold over 1 million copies. Not long after the success of The Barefoot Contessa Cookbook and Barefoot Contessa Parties!, Garten was approached by Food Network with an offer to host her own television cooking show. She rejected this proposal several times, until the London-based production company responsible for the popular Nigella Bites was assigned to the deal. She acquiesced to a 13-show season, and Barefoot Contessa premiered in 2002 to a positive reception. The program focuses on hearty, guest-oriented food, and Food Network found a popular hostess in the "calm, Rubenesque" Garten. The press began comparing her television presence to that of her mentor, Martha Stewart, but with a softer edge and more nurturing, comforting manner. The show does have its critics, however, who sometimes deride her consistent use of extravagant items, such as hundred-dollar cuts of meat and saffron, her insistence that the viewer use the "best" of a given ingredient, the high calorie count of her meals coupled with the very large serving sizes, and the frequent shots of her various BMWs, silver services, china collections, and other luxuries. 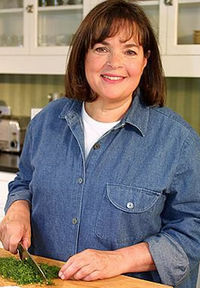 Barefoot Contessa has approximately 1 million viewers tuned in per episode, and has posted some of Food Network's highest ratings. In 2005, the show was nominated for a Daytime Emmy Award in the category of Best Service Show. 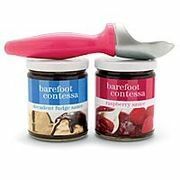 In 2006, Garten launched her own line of packaged mixes, marinades, sauces, and preserves, branded as Barefoot Contessa Pantry, in conjunction with Stonewall Kitchen. These convenience foods are based on her most popular from-scratch recipes, such as coconut cupcakes, maple oatmeal scones, mango chutney, and lemon curd. Pricing of these items is comparatively expensive (i.e. the MSRP for a single box of brownie mix is ten dollars) and they are only sold through upscale cookware and gourmet shops such as Williams-Sonoma and Chicago's Fox & Obel Market Cafe. She plans to expand this brand in the near future if the first line of products is successful. This consistent use of the original store name through her books, television show, and product line has led her fans to refer to her as simply "the Contessa". However, she is Jewish-American, not Italian, and has no connection to any title of nobility. Stewart played a large role in the early development of Garten's career, championing her store, recipes, and home décor, going as far as to feature both Garten's home and one of her bakery confections on 1998 and 2001 covers of her popular magazine, Martha Stewart Living. After years of being friends and co-workers, however, the two women became bitter rivals when Stewart attempted to take credit for one of Garten's recipes. They have reportedly mended their relationship, with Stewart writing a glowing foreword for The Barefoot Contessa Cookbook. In turn, Garten penned several columns on entertaining and cooking for Stewart's magazine. Stewart's sister, Laura Plimpton, has also been featured as a party guest on Barefoot Contessa. Garten has credited Eli Zabar with the inspiration of her main cooking method, in which "all you have to do is cook to enhance the ingredients." Under his tutelage, she refined her signature style of using high quality ingredients to reinvent and simplify classic recipes, with an emphasis on the natural flavors of foods. Zabar is famed for his string of gourmet markets and bakeries located on New York's Upper East Side, along with his rooftop greenhouse gardening designs, and is often seen as a guest on Garten's Food Network show. She frequently recommends his baked goods and produce to her viewers, and has filmed a segment on location at his flagship store, Eli's Vinegar Factory. Throughout her cookbooks, she promotes his retail products and has even included her take on some of Zabar's most popular recipes, such as shortbread cookies. When Stewart was incarcerated in 2004 on charges connected with insider trading, the press began singling out Garten as the rising grande dame of the domestic arts. After much critical acclaim and excellent sales of her first three cookbooks, she went on to write the bestselling Barefoot in Paris and several columns for O, The Oprah Magazine. She also serves as the entertaining, cooking, and party planning consultant for the magazine. House Beautiful, a women's magazine that focuses on decorating and the domestic arts, features a monthly column entitled "Ask the Barefoot Contessa." In this column, she doles out cooking, entertaining, and lifestyle tips in response to letters sent in by her readers. She launched a small line of notecards and journals to complement her books, and wrote the forewords for Kathleen King's Tate's Bake Shop Cookbook and Rori Trovato's Dishing With Style. One of her signature recipes, lemon roast chicken with croutons, was featured in The Best American Recipes 2005-2006. Another of Garten's dishes was selected for Today's Kitchen Cookbook, a compilation of the most popular recipes featured on the daily news program The Today Show. In 2005, she announced that she had signed a three-year contract with Food Network to continue her cooking show, and will release two more cookbooks following Barefoot Contessa at Home (due for release in October of 2006). Garten was reportedly awarded the most lucrative contract for a culinary author to date, signing a multimillion dollar deal for multiple books. She has also been approached several times to develop her own branded magazine, line of furniture, set of signature cookware, and chain of boutiques (reminiscent of Stewart's Omnimedia), but has declined these offers, stating she has no interest in further complicating her life. Between 2004 and 2005, Barefoot in Paris sold almost 400,000 copies and rose to the #11 slot on the New York Times bestseller list. Her sporadic public appearances and book signings usually command large audiences, with her signings (usually held in upscale bookstores or cookware shops) garnering crowds of 500 or more. When she launched her Barefoot Contessa Pantry product line in early 2006, the projected turnout was 300 people for the small Fox & Obel Market. Instead, close to 2,000 fans appeared hoping to sample the new line and meet briefly with Garten. "...we all know that families now aren't necessarily like Ozzie and Harriet (it turns out Ozzie and Harriet's family wasn't all Ozzie and Harriet)... family has a traditional context, but today it's not as simple as two parents with 2.3 kids... it's about relationships... it's about people who are bound together by love and a sense of being responsible for one another... it's spouses with no children, like Jeffrey and me... it's a group of women who meet to cook dinner together once a month... it's a one-parent family with adopted children... it's two men who've made a life together... at the end of the day, all we have is love... getting love, but even more, feeling love..."
She has contributed significant amounts to the presidential campaign funds of George Bush, Sr., Bill Clinton, and John Kerry. She is registered in New York as a Democrat. Garten also sits on the Design Review Board for East Hampton, a panel that grants various building permissions and approves architectural and design elements of the village. The board seeks to protect the historical district and further the overall aesthetics of the area. Garten is known to guard her privacy closely, giving few interviews and declining to take part in various Food Network charities and activities. Her family of origin is shielded almost completely from the spotlight; and, unlike her friends and colleagues, they are not featured on her Barefoot Contessa. However, her road to fame and personal life were recently explored in the Food Network series, Chefography, an hour-long documentary similar to the A&E program Biography. The show featured candid interviews with her husband, close friends, and former clients. No members of her family of origin were interviewed for Chefography. Garten is Jewish-American by birth, as is her husband, but rarely references her religion and ethnicity. It is showcased only through the inclusion of classic Jewish cooking in her television show and cookbooks, when she makes such dishes as rugelach, challah, and brisket. The level of influence that her Judaism plays in her life is unclear, although it is known that she does not keep kosher. She remains married to Jeffrey Garten, former Undersecretary of Commerce for International Trade and former dean of the Yale School of Management, now Juan Trippe Professor in the Practice of International Trade, Finance, and Business. Her husband can also frequently be spotted on her cooking show, assisting her with menial tasks or sampling the dishes she has created. They divide their time between Southport, Connecticut, East Hampton, New York, and Paris, France. After encouragement from her husband, Garten purchased a pied a terre in the 7th arrondissement of Paris in 2003, and has filmed an episode of her cooking show on location there. The couple recently celebrated their 38th anniversary, having wed when Garten was only 20, and they have no children. Garten, Ina & Stewart, Martha (1999). The Barefoot Contessa Cookbook. Clarkson Potter. ISBN 0609602195. Garten, Ina (2001). Barefoot Contessa Parties! Clarkson Potter. ISBN 0609606441. Garten, Ina (2006). "About Ina.". Barefoot Contessa Online. Network, Food (2006). "Ina." Chefography. The E.W. Scripps Company.